A t-shirt at Gymboree inspired me to make this card. I love the bike headed to the beach! 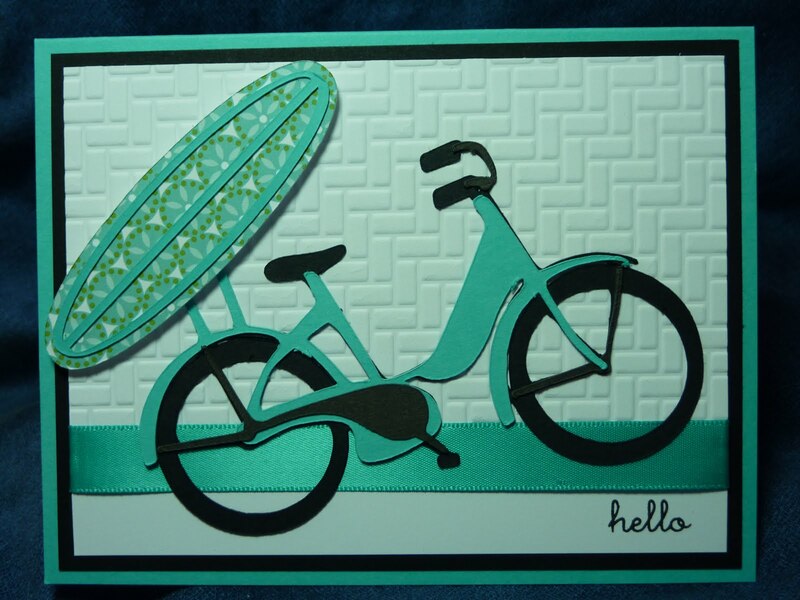 The bike, which I've been dying to use, is from the Just Because Cards cartridge, cut at 8". I used my Gypsy to weld two thin rectangles to it to create the little surfboard carrier. The surfboard is cut at 2.5", from Life is a Beach. 8 1/2" x 5 1/2" Hawaiian Shores cardstock, scored at 4 1/4"
I love the colors you chose! Very retro! Thanks for posting to myshericrafts! great summer card! i have never seen the bricks cuttlebug folder...i really like that.